Seeding by the air was one of the first Aerial Application in Pennsylvania. John Chaytor spread seeds on swamp covered ground in New Zealand in 1906 using a hot air balloon. Today, seeding is still done via the air since it is faster and more efficient than traditional hand-planting. By 1921, conventional crop dusting was an idea in the making with the United States Agriculture Department with assistance from the Army Signal Corps. The term crop dusting even originated in America since early aerial applications involved a dust-like covering descending down over crops from the air. Today, helicopters are the vehicle of choice in many types of aerial applications including the many facets of crop dusting such as seed spraying, watering, pest control, frost prevention and more. Helicopter spraying has been found to be more effective thanks to the power behind the blades. FairLifts is the go-to source in Pennsylvania for finding the best aerial application options available. Pennsylvania was one of the original 13 colonies and the only one not bordering the Atlantic Ocean. The Keystone State is home to quite a bit of history and is famous for many things from Hershey chocolate to cheese steaks to Punxsutawney Phil and Groundhog Day to the signing of the Declaration of Independence in Philadelphia. Pittsburgh was nicknamed the Steel City because of its industrial contributions. However, Pennsylvania is also known for its lush and prosperous farmlands. Dairy and beef are two of the state’s prime agricultural products, but Pennsylvania’s crops are a big part of the economy as well. Greenhouse and nursery plants are a huge business in Pennsylvania as are corn, wheat, tobacco, oats, hay and soybeans. Other veggies like potatoes, beans and cabbage along with apples, grapes, peaches and strawberries all combine to form important cash crops for the Pennsylvania economy. With agriculture being a big business in Pennsylvania, it is a prime spot for aerial application options that make crop management cost-effective and convenient. Aerial Application in Pennsylvania is such a big part of the economy and making the decision to engage helicopter spraying to manage your commercial or private farm or nursery is an important one. With FairLifts, farmers and growers have access to the always expanding network of aerial application services available in Pennsylvania, assisting you in finding the ideal service for your needs. Helicopter spraying options include a variety of crop dusting choices like frost prevention and treatment along with mosquito, pest and weed control. Crop dusting is a broad term used in the aerial application business to describe a menu of options. Watering is available in those times when Mother Nature doesn’t cooperate and can be used to offset drought conditions. Proactive fertilizer and fungicide applications help crops thrive while seed spraying provides more effective planting. Through FairLifts, farmers and growers can access the diverse aerial application services on tap in Pennsylvania. Farmers aren’t the only folks bothered by mosquitos. These disease-carrying insects have been an issue for many Pennsylvania residents. Proactive spraying is the best way to keep these annoying pests at bay. Other pests like beetles, caterpillars, moths and even grasshoppers can do a lot of damage to flourishing crops, making regular pest control options a must for farmers and growers. Helicopter spraying is known to be much more effective than conventional ground methods when it comes to pest control. Whether you are a professional grower or a novice gardener, weeds are more than a nuisance. Weeds rob plants of nutrients from the soil as well as water and sunlight. Unlike plants which grow at a slower pace, weeds flourish, which is where the expression “grow like a weed” originated. Proactive helicopter spraying of herbicides prevents weeds and brush from overtaking delicate plants and depriving them of the essentials plants need to thrive. Frosts typically begin occurring in Pennsylvania in late September with the last frost coming in late April and early May. However, Mother Nature has been very fickle of late with warm ups in the middle of winter and unexpected frosts. To commercial farmers and growers, an unexpected frost can be deadly to crops, making frost prevention options and treatments a must. Many frost prevention options include smoke production and applying a layer of water, which can actually prevent fragile plant cells from freezing. 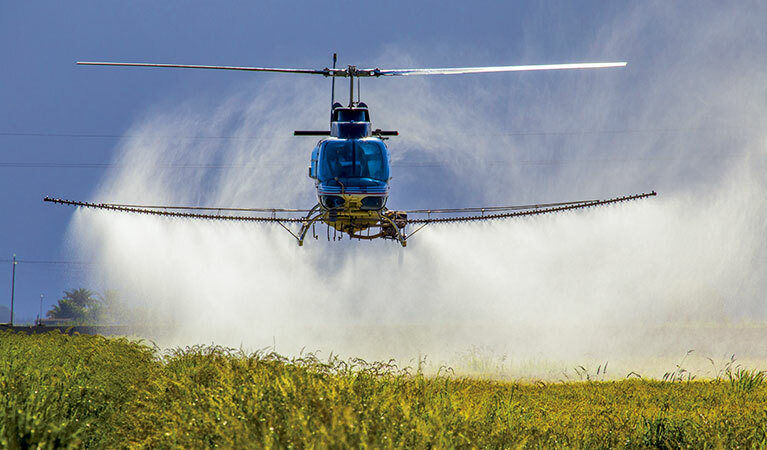 If it is helicopter aerial application services in Pennsylvania that you require, FairLifts is the professional, go-to source connecting commercial and private farmers and growers with a network of the best pilots and operators in the helicopter spraying industry. Our staff is experienced in the field of aerial application and can direct you to the service suiting your individual needs. Call us to fid out about Aerial Application in Pennsylvania.